Model of the car to be glued. Size: 1:24; 18.1 cm. Packaging includes: 173 stickers. The guiding principle of all current bathtubs and transporters is the platform truck, whose roots extend to the Volkswagen factory in Wolfsburg until the end of the 1940s. An impromptu in-house conveyor told the Dutch importer Ben Pon a new truck. At the end of the 1940s VW developed several prototypes of a spacious vehicle suitable for transport purposes. Since no proposed names were available for free use, the new car class got a simple "Transporter" name. Its first generation came into production on March 8, 1950. A truck with a typical front-end V and split windshield was available in various versions including a minibus. Its technology was based on Volkswagen Type 1, the so-called "Beetle". 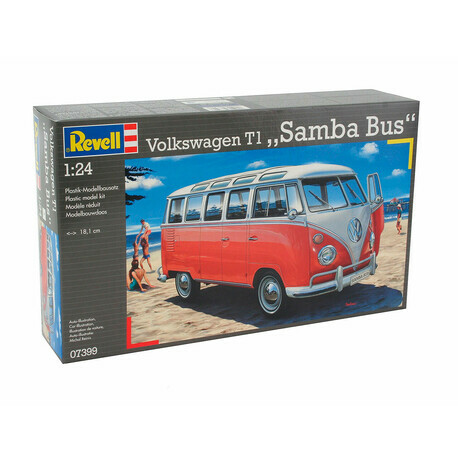 T1 was therefore an air-cooled four-cylinder boxer. This reliable, rear engine has a volume of 1.2 liters. Its performance was increased to 34 horsepower in 1961. The luxury version of the minibus, a special nine-figure model, is still known as the "Samba Bus" and with its oval roof windows, very comfortable seats, folding roof and plenty of chrome parts has its truly unmistakable car charm.